This is the fourth time in the past five years that I have run this race. The race begins and ends at the Ridgewood Shopping Center, conveniently located in front of two of the sponsors, Fleet Feet and Whole Foods. The course is somewhat challenging, as the first two miles are downhill, and the remainder of the race is uphill with many turns between miles two and four. I once again ran while wearing the Zensah shin/calf compression sleeves, and I absolutely love them! 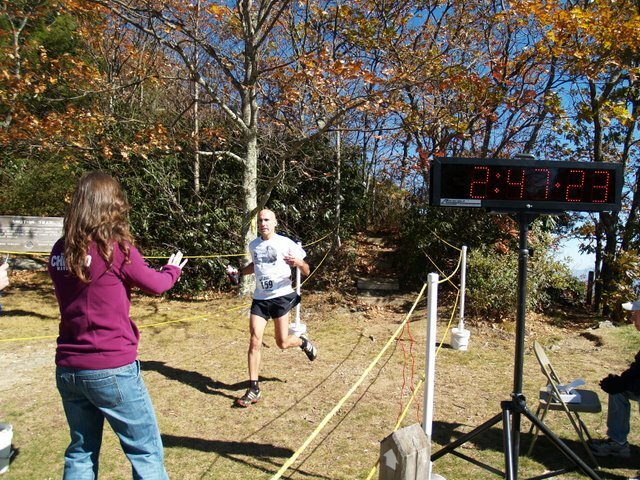 I also raced in the Mizuno Ronin. A sweet shoe. I’ve just started a two-week regimen of antibiotics, and had almost talked myself out of even running the race. 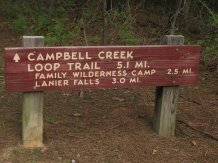 I also ran the Raven Rock Rumble a mere four days ago, and completed the last of three treadmills workouts for Meredith College Human Performance Lab a mere two days ago. I had many excuses not to race this morning, but what’s Thanksgiving like without a Turkey Trot? Even though I was feeling a little under the weather and somewhat tired, I was nonetheless looking forward to this race as I knew my very good friend, Chad, and his wife, Sarah, would also be racing. 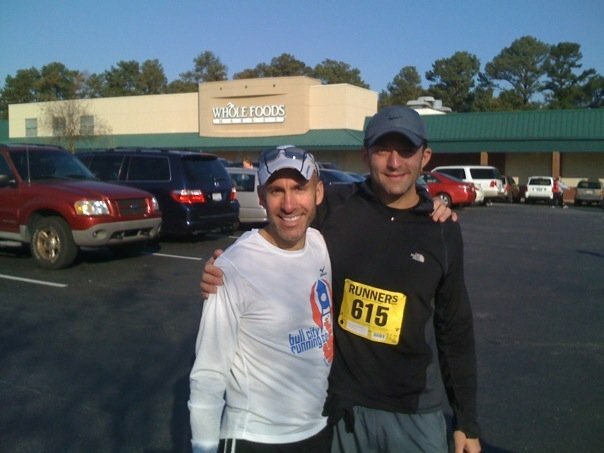 Chad and I had been training together most of the Fall in preparation for his first marathon. Unfortunately, he got injured, and was not only unable to run the marathon, he has not been running much at all. I hadn’t seen him in months. 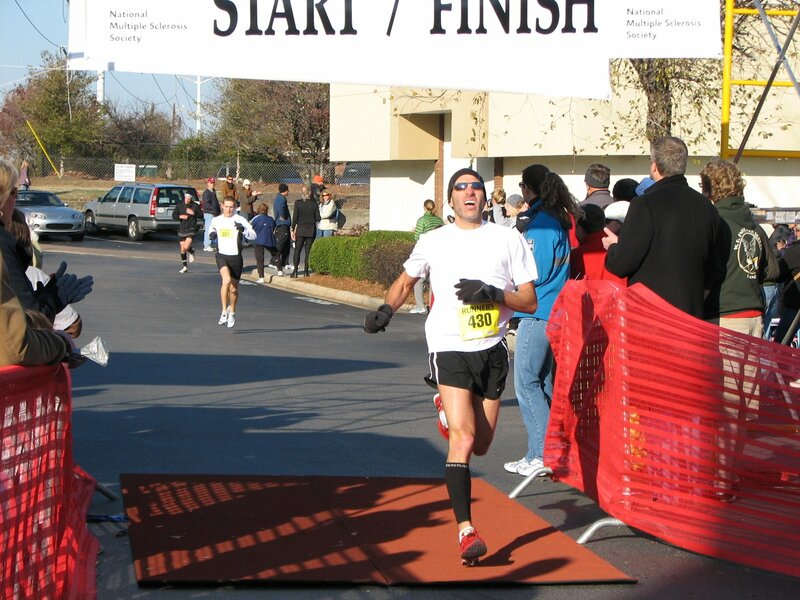 My goal was to finish the race in less than 30 minutes. This was one of my most strategically run races, and I was very pleased with my time, place, and performance. The start was somewhat congested, and I did have to weave my way past some runners as we made our way down Ridge Rd. Once the crowd cleared, I was in ninth or tenth place. I saw my friend, Jonathan (last year’s winner; I placed second) running with another man, and I made my way up to them before mile 1. 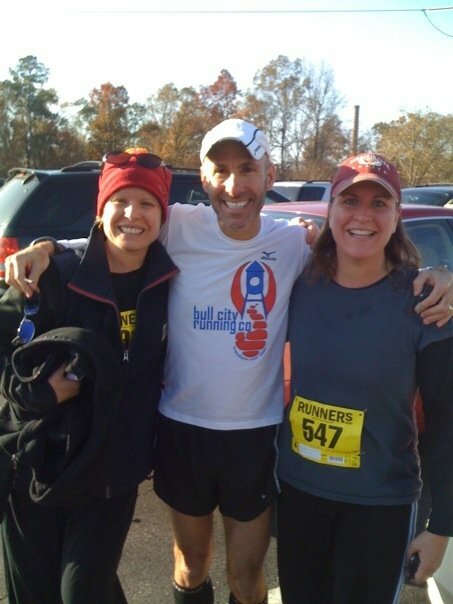 The three of us ran together for a while, and were then joined by another runner, whose name I later learned is Kevin. As the course was downhill, Kevin and I dropped Jonathan and the other runner, and set our sights on the next two runners, who were 200 or so meters ahead of us. We hit the mile marker, and Kevin heard my Forerunner beep, so he asked for the split: 5:41. Kevin and I traded places numerous times between mile 1 and 2 (still downhill on Ridge Rd). At mile 2, we took a right turn and began running through a neighborhood. There are many hills, and some of them are steep. At about mile 2.5, we finally caught the two runners we had (without saying a word to each other about it) set our sights on. One of the runners we immediately dropped, and the other stayed with us for couple of hundred meters. When he did drop, I gave him words of encouragement. Kevin asked for the split at mile 2: 5:43. Kevin and I once again kept trading places between miles 2 and 3, with me passing him on the downhills, and him catching and passing me on the uphills. At mile 3, without waiting for him to ask, and I said, “6:08. Not bad considering the hills. 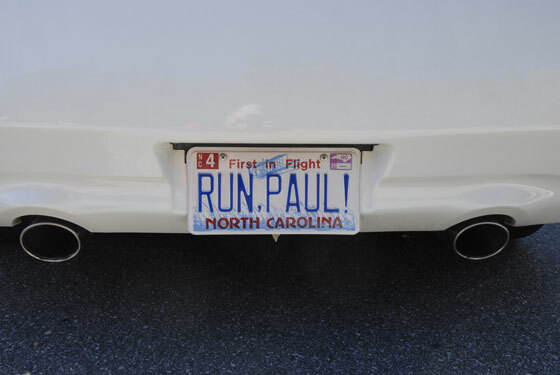 By the way, you’re only running with me so I can give you your splits.” He laughed, and asked me if I was from Raleigh. I introduced myself, he introduced himself, and the conversation stopped. We were running too hard to talk for very long! Surprise, surprise, Kevin and I kept trading places between miles 3 and 4. I truly enjoy running — racing, if truth be told — with someone, as I tend to remain focused on the race, and I generally run faster. As we took one last right turn back onto Ridgewood, I glanced behind us, and saw that there was a runner catching up with us. 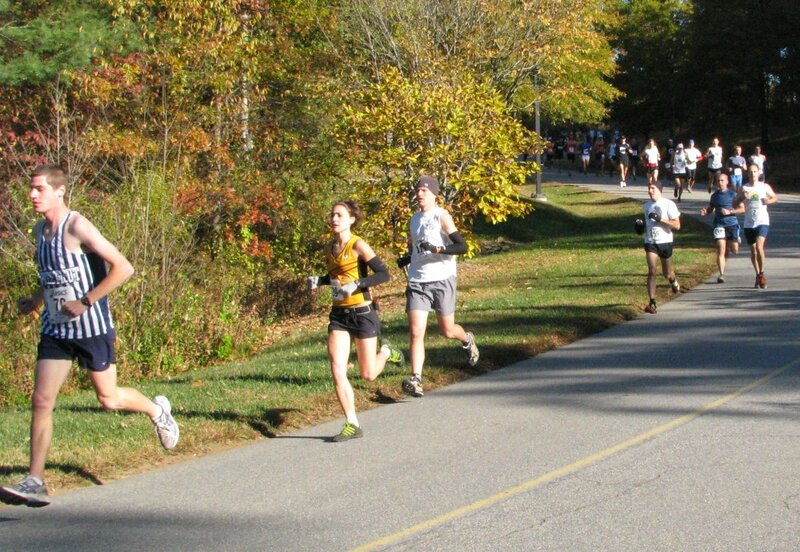 I don’t like to be passed, particularly not during the last miles of a race. My first thought: If it comes down to a sprint to the finish, Kevin and the other man will more than likely pass me. If I want to make a move, I had better do it soon. I waited until mile 4: 6:10. I then picked up the pace in an attempt to drop the two. I did manage to drop Kevin, but the other man (Charley) kept breathing down my neck. I ran the last mile in about 5:30. Looking at the results, Kevin came in sixth and was caught and passed by Charley. Charley finished in fifth, just four seconds behind me (as you can see by the picture). Kevin finished in 29:22, just 10 seconds behind me. Charley came in first in the 25-30 age group, and Kevin came in second. I congratulated both Charley and Kevin as they came through the finishing corral. I got a quick drink of water, and then went to find Chad. By the time I got to him, he was about a half mile from the finish. I ran backwards while talking to him, but could tell that people thought I was showing off. I wasn’t! I was just trying to belittle Chad. It worked! As I was changing shirts, I heard some people say my name. Lane, Kelly, and their husbands! I hadn’t seen them in years. I won a $100 gift certificate for Mizuno products. Maybe a new pair of Ronins? I broke the old Master’s Course Record set by yours truly last year. All tests performed at Meredith College Human Performance lab by Dr. Chris Eschbach, Ph.D., Samanatha P., and Laura M.
This is the third time I’ve taken the V02 Max test, so I knew what to expect. And I wasn’t looking very forward to it. The test is exhausting. I truly despise running on a treadmill, too. I wore a heart rate monitor and an oxygen mask for the duration of the test (once I warmed up). All intervals (with the exception of the last) were 3 minutes in duration followed by a 1 minute recovery. The treadmill grade was 1%. During the recovery, a blood sample, to measure lactic acid, was taken from my left ear lobe. I was also asked to rank my degree of effort from 1 (very easy) to 20 (extremely difficult). I could also stop the test at any time by requesting that Chris and/or his team turn off the treadmill or by pressing the Stop button myself. Round two was at 6.2 mph or 9:40 mpm pace. Heart rate increased to 124, and again, this was very easy. Round three was at 7.5 mph or 8 mpm pace and heart rate was 140. Still easy. Round four was at 8.7 mph or 6:53 mpm pace and heart rate rose to 150. Getting more difficult. Round five was 10 mph or 6:00 mpm pace and heart rate was 163. Yes, now it was getting difficult. Round six got even more interesting. And grueling. 11.2 mph or 5:20 mpm pace. My heart rate rose to a very high 175 bpm. Very difficult indeed! The seventh and, for me, final round was still at 11.2 mph, but the incline was increased to 3%. My heart rate increased to 177 bpm. Chris’ assistants let me know that I only needed to make it 90 seconds at this pace and incline for the results to be included. I just made it! I was gasping for air! I was happy to finally remove the oxygen mask. V02 Max is 56.6. Above 45 is the goal. My V02 Max has also increased from test to test. My LT heart rate is 165. Base training should take place at less than 6:32 mpm and less than 156 heart rate. Easy enough! Training Zone 1, 6:34 – 5:52 mpm and 156 – 164 heart rate. Training Zone 2, 5:52 – 5:46 mpm. Certainly within (and often better than) my 5K pace. My maximal heart rate is 177. A standard way of measuring maximal heart rate is your age subtracted from 220; thus, 176 (until next month when it will be 175). Almost spot on! Finally, my pace at Lactate Threshold is 5:47, which is 93% of V02 Max. According to Chris, this is good, as it shows I have room to continue to improve — by a mere 7%, but that still does leave room for improvement. I should be able to run a marathon at 5:47 pace, i.e., 2:31:31. My PR is 2:47. Much room for improvement, huh? Chris always does an incredible job of explaining and executing the tests, and — most importantly — explaining the results. In fact, it is because of his advice based on my last V02 Max test that I changed my training approach: I rest one day a week (usually Monday). I also carry a water bottle with me when I run any race longer than 10K. I’m thus well-rested for critical speed workouts (usually Tuesday), and never thirsty during races. I chose to complete the heat test next, as Chris, Laura, and Samantha let me know what to expect, and I wanted to get it over with. I arrived at the lab, changed into my running clothes, and then sat for 30 minutes within an enclosed portion of the lab. This consisted of the treadmill, computer and equipment, and two space heaters, all enclosed within sheets of plastic from ceiling to floor. Samantha told me that I needed to sit within the area to acclimate to the heat. The temperature was an uncomfortable 97 degrees. Chris joined me and he reviewed the results of the V02 Max test. I was fitted with the heart rate monitor and oxygen mask. I then ran on the treadmill for ten minutes, and was told to run at whatever pace I was comfortable with. I ran at 8 mph. After running for five or so minutes, Samantha asked me to increase the pace so that I could increase my heart rate. The goal was to keep my heart race at 158 bpm, which is 90% of my maximal heart rate. Samantha controlled the pace throughout the actual test. Just before the official start of the 45-minute test, Samantha increased the speed to 9.4 mph (6:23 mpm). For each of the three intervals, I ran 15 minutes and for the last three minutes (four if you include the fitting) I wore the oxygen mask. The speed would be decreased to 1 mph for one minute as Laura took a blood sample from my left ear and Samantha took my temperature from my right ear. As the test progressed, my speed decreased. For the last interval, I was down to 7.8 mph (7:41 mpm). My heart rate remained at 158 bpm. Not only did my speed decrease, but the degree of difficulty increased significantly. I was exhausted after this test! This test was exactly like the 2nd test, but the temperature was a very comfortable 72 degrees. Not much to report, as my pace remained a very consistent 8.9 mph (6:44 mpm) pace until the last three minutes when pace decreased to 8.7 mph (6:53 mpm). I was comfortable throughout, and found this test to be rather easy to complete. So, did Chris discover what he set out to discover? I’m anxious to see the results. 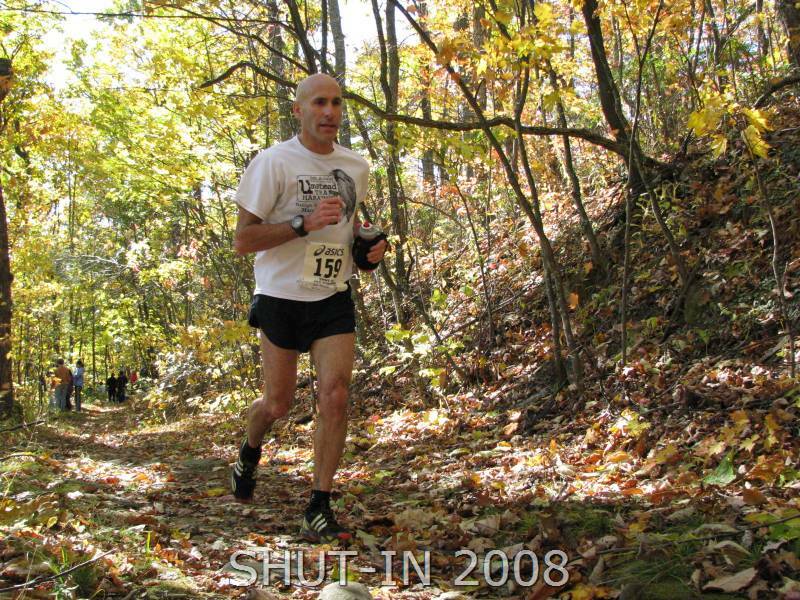 Held at Raven Rock park, the Rumble is a somewhat challenging race, with many hills, exposed roots and rocks (most covered with leaves), and steps. Yes, steps once again. Two races in a row! As it was a chilly morning, I wore a long-sleeve technical shirt, mid-thigh high running shorts, a hat, gloves, shoes and socks (yes, goes without saying, but so does a shirt and shorts), and, for the first time, Zensah shin splint/calf compression sleeves. I’ve worn arm sleeves before, but never calf sleeves. I have somewhat overdeveloped calves, and underdeveloped hamstrings. This may be why I can run downhill with little effort and with very little need for recovery, and am not a particularly strong of uphill runner. I wore the sleeves all morning, i.e., driving to Lillington, warming up, racing, cooling down, driving home, and while taking the dog on a two-mile walk. Most of the time, I wasn’t even aware that I was wearing them. They are designed to prevent shin splints and calf injuries as well as aide in the recovery of splints or strains/pulls to the calf muscles. They are extremely comfortable to wear, and not at all restrictive or constricting. They are made with antibacterial and hypoallergenic material, and can be worn during any kind of weather, i.e., hot, cold, and any temperature in between. I’ll most definitely continue to run and race while wearing them. I picked up a pair of Zensah arms sleeves today. 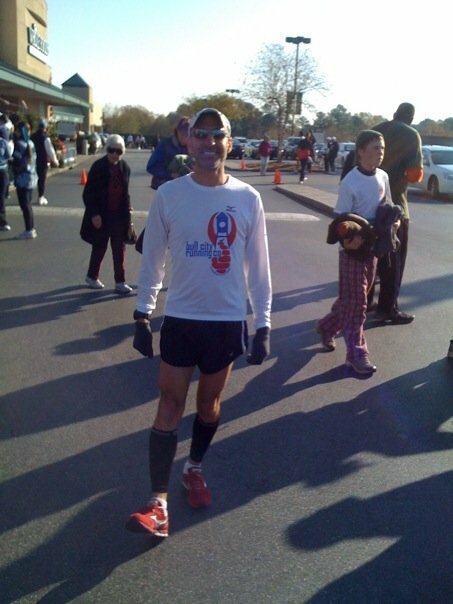 I plan on wearing shin/calf and arm sleeves at the upcoming Charlotte marathon. I may even wear shorts. And a shirt. And shoes and socks. The race started promptly at 9 am, with Scott from Off ‘N Running Sports officiating. There were three of us in the lead pack, with a young man wearing a Florida Seminoles shirt leading most of the way, and another young man breathing heavily, yet staying with us. At mile two, Florida put some distance between us, as it was (no surprise) an uphill part of the trail. I dropped the person in third place. Mile two to four were uneventful. Mile three, however, took place on a different trail than last year’s race, and it was much more treacherous. Many, many steps, and quite a steep downhill trail, too. Last year there was a water stop at the bottom of the hill, and my friend Phil Bailey had to tell me to turn around and go back up the hill! I was expecting something similar to happen this year. I was also expecting Florida to be heading back up the hill, as he was out of eyesight by this time, and had put distance between the two of us. Instead, the trail ended, and was taped off. No water stop or anyone giving directions. No sign saying, “Paul, turn around!” And no Florida. I stopped. Literally. I looked for a trail that wasn’t there, but that I was convinced Florida had seen and taken. It then dawned on me that this was indeed the turnaround. I waited for the rest of the pack to make it to the spot, so that I could at least get my thought confirmed! We all agreed that, while not clearly marked, it was indeed the turnaround. And turn around we did! I probably lost a minute or more. I expected the rest of the pack to stay with me, as mile four was uphill, and I’m not the strongest uphill runner. To my surprise, I quickly dropped the rest of the pack. As mile five was also near the finish, there were lots of spectators, and they cheered loudly. Some even yelled my name. I suspect that was Scott and Phil. Mile five through eight were uneventful. I could neither see nor hear anyone approaching from behind, and I pretty much turned it off. I kept thinking about the upcoming marathon, and I felt no need to push the pace. 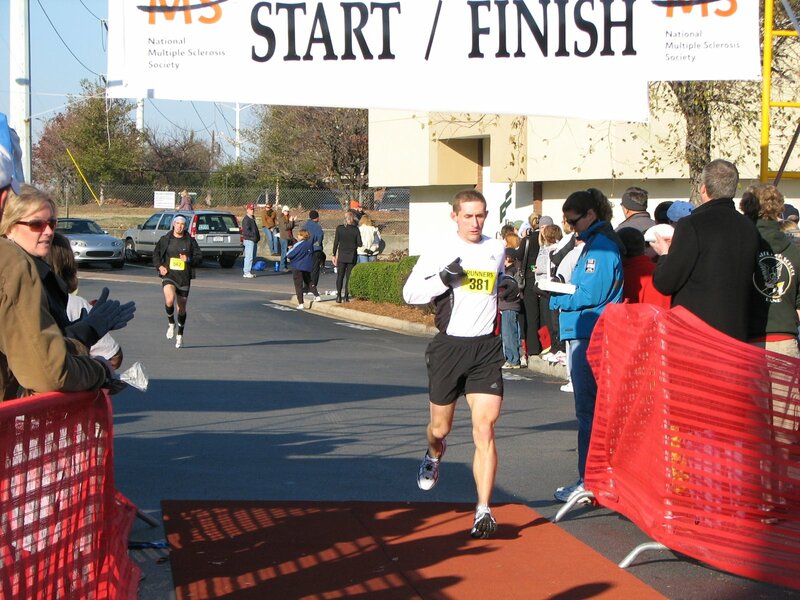 I began to pass many five-mile racers, and continued to do so through the finish. Speaking of the finish, it came upon me much sooner than I expected, and I didn’t even give a finishing kick. I ran to my car, and as doing so heard someone yell, “And still you’re beating me! I was following your white shirt the whole race.” I introduced myself, as did Cullen, the second place finisher. He also was nice enough to take my picture. 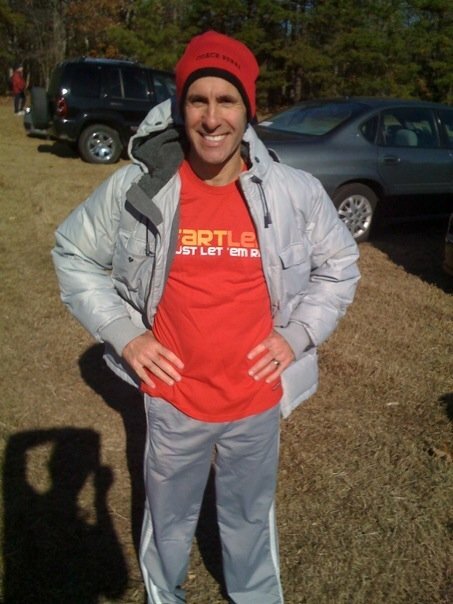 Yes, the shirt say “Fartlek, Just Let ‘Em Rip.” My friend Jason Figge, another member of Carolina Godiva, came in third. A fun race, and I’ll probably run again next year. Look for pictures of me running in the sleeves, as they’ll be posted soon. Yes, it’s been two weeks since I ran the race. No particular reason why I haven’t posted. I recall as much about the race today as I did on race day. A truly challenging race! A truly challenging hike! Well, at least the last two miles. The lead pack took off immediately, and I certainly never caught them. Given what my good friend Jim C., whose run the race for the last 18 years, had told me, I did not want to go out too strong. In Jim’s words, “Don’t shoot your wad before Ferrin Knob.” I also thought I had started my watch, but had not; thus, I was never quite sure of the mileage. Just as well! 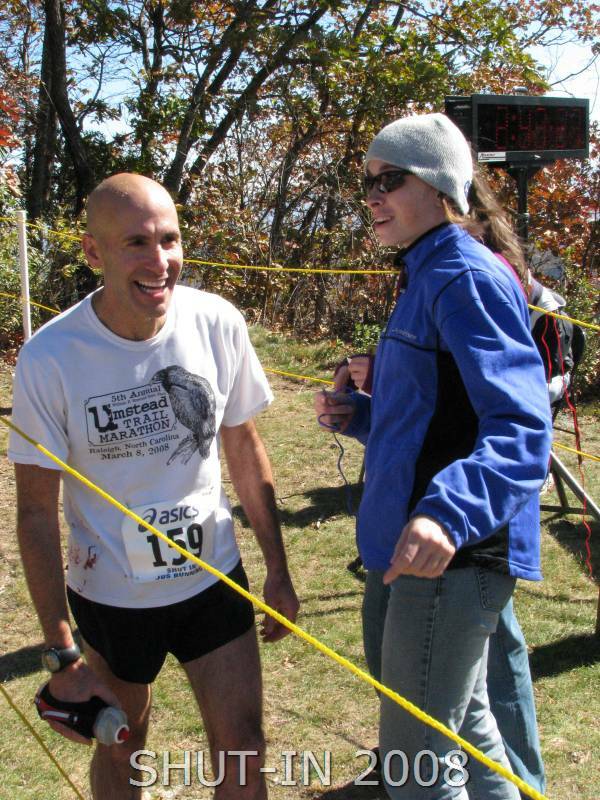 Monk, a local Trailhead runner, and Amber, the first female finisher, were in the group I ran with initially. At the first steep climb, Ronnie and his friend, Josh, ran quickly by me. This was at about the 3-mile mark. It was also the first (of many times) that I walked. Believe me, the climbs were so steep that I could not have possibly gotten up them any faster by running. At about the 5 or so mile mark, Jim C. caught up with me. He, rightly so, suggested that I remove my skull cap, as I was beginning to overheat. I dropped him at mile 7 or so, and numerous times throughout the race thought he might catch me. Jeff was waiting for me, as we had planned, at the the 10-mile aide station, and I was delighted to see him! I acted in typical fashion. What’s this, you ask? I took off my gloves and threw him at his feet, threw my skull cap at his feet, threw my empty Gu wrappers at his feet, took 3 Gus from his outstretched hands, and was on my way. No hello, no thank you. I’m too damned focused! At about mile 12, I was following Amber. We were running downhill, and I was looking for an opportunity to go by her. Unbeknownst to me, there was a fallen log beside the trail, with a rather thick limb stretching over the trail. I saw Amber veer quickly to the left, but it was too late for me. I hit the limb with my right hand as my arm was on the upswing. In fact, I hit the limb so hard that it quite literally spun me around, and I found myself facing the opposite direction. The wind was knocked out of me, and I had to momentarily stop running. I suffered two deeps cuts, one on my pinky and the other on my ring finger. Two weeks later, and I still have healing scabs! I was bleeding quite profusely, and used my white Umstead Marathon shirt to try to stop the flow. At each of the remaining aide stations, I got quite a few concerned looks! Carolyn (Jim’s spouse) was at all of the aide station, and she encouraged me at each and every one. She could also tell that I was in a little bit of pain. Jeff was waiting for me at the finish, and I’m glad that he didn’t see me, as he had heard that there were bow and arrow hunters in the woods. I looked like I had been shot. There were times when I knew my heart rate was at the maximum, and, for the most part, I listened to my body. As I mentioned, I did indeed walk numerous times throughout the race. When Mark was ahead of me, I would walk whenever he walked. 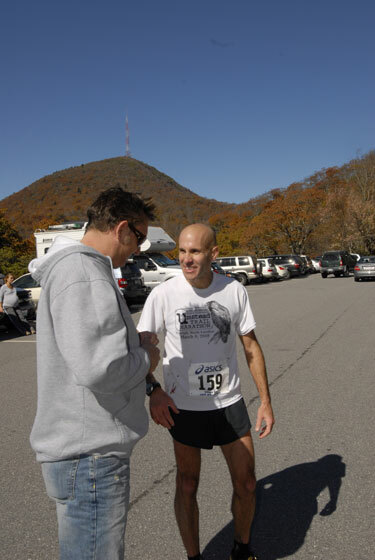 At about mile 15 or so, I caught up with Monk, and he (self-admittedly) looked very bad. He was indeed walking, and looked defeated. I offered him food and water, which he refused. I recently saw him at R.E.I., where he works, and he thanked me for offering my assistance, and congratulated me on my finish. It was very hard to keep track of my place, as I was being passed and then often passing many who had passed me. This was particularly true during the last 4 or so miles. The finish was a steep downhill of about 200 meters and with many sharp turns. Before you get to the finish, though, you had to climb, yes, climb, for 2 miles. The trail was rocky, with many twists and turns. It was so steep that I had to press my forearms on my thighs to keep myself upright! Before I even realized it, I was at the finish. The woods ended, and the finish corral was immediate. I wasn’t ready to stop, and had to be told to do so! My first thought, “I don’t want to run this ever again, as I enjoy running but don’t particularly like hiking.” I said as much so to anyone who would listen, including Jeff. I would like to run the race again next year. I would train for it differently, though! I have already begun to briskly walk up the stairs at work at least two times a day, for a total of over 200 steps. With proper training, I could take at least 7 minutes off of my time. Wishful thinking, perhaps, but time will tell!